Built on IBM OpenPOWER architecture, these servers combine high-performance, storage, and I/O to focus on increasing volumes of data while maintaining system speed. POWER9 servers will put your data to work, not just store it. Create a private and public hybrid cloud, and experience lower latency, better application efficiency, and increased cost savings. The IBM Power Systems AC922 is a complete redesign supporting the latest technologies including CAPI 2.0, PCIe Gen 4, as well as NVLink 2.0 which is embedded at the silicon level and tightly coupled with the CPU. For the type of workloads that IBM is targeting, such as big data analytics and cloud, the capabilities inside the processor are critical. 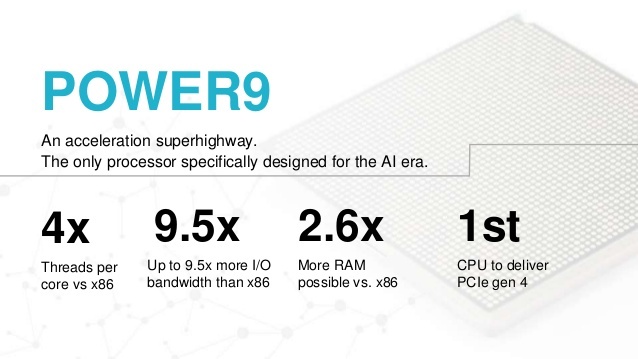 By having eight threads per processor core, POWER9 is able to deliver parallel processing of data queries. This means it is able to resolve queries faster than other processor architectures. IBM® Power Systems™ AC922 for High Performance Computing will unlock new potential for your GPUs regardless of industry. NVIDIA® NVLink™ Technology unlocks up to 150GB/sec of bi-directional bandwidth for data-intensive workloads, nearly 5X the CPU:GPU bandwidth of PCIe. Each GPU is serviced with 300GB/sec of NVLink bandwidth, nearly 10X the data throughput of PCIe x16 3.0 platforms. Snap ML’s implementation of random forest is 2-4X faster than sklearn and decision trees 3-4X faster than sklearn and supports Generalized Linear Models and Tree-based models. Sklearn is the most widely-used Machine Learning framework based on the Kaggle Data Science Survey 2018. It's easy to provision your own POWER9 server. Just sign up now and dive even deeper into deep learning.